This is yui from Tokyo again. 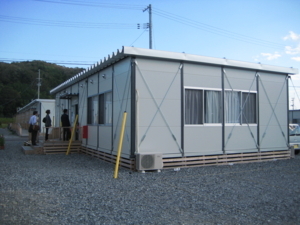 We, the Japan Foundation, will have an project in Ishinomaki from 3rd of Dec. to 11th of Dec. The project is an art project that an graffiti artist paints walls of temporary houses with residents. to give a chance for residents to communicate with each other and help them to make more cheerful community. We hope this project will work well and be a fun experience for residents. Embassy of Brazil in Tokyo, Ishinomaki furusato-fukko-kyogikai and Tokyo Ghetto Guide Project are supprorting this project. 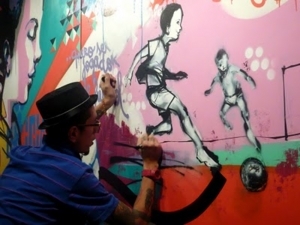 The artist is Titi Freak, who is a famous Brazilian graffiti artist. He is the 3rd generation of Japanese having immigrated to Brazil, and was born and has grown up in Sao Paulo. When we visited Ishinomaki for preparation, he was talking with his son on the phone with a huge smile!! 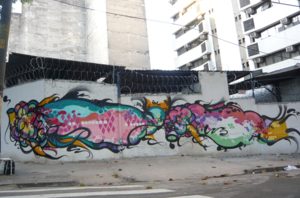 Titi's graffiti works are fascinating. 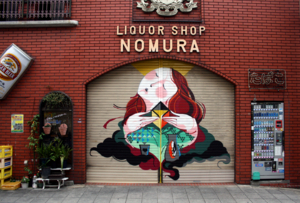 He drew various pieces of graffiti all over the world. He has also collaborated with NIKE, addidas etc. He is such a star artist! He says that he likes fish and cloud, and you can see them in his works. His nice graffiti of fish fascinated many residents in Ishinomaki! Do you want to know how the graffiti in Ishinomaki will look like?? I will report this project with pictures on the Japan Foundation's page on facebook, twitter and this blog.